Happy Friday to everyone! As I keep saying, this week was insane and I am so happy that it's over. I have three more performances of the musical, then I can finally take a rest. Playing this much makes me miss college when I played in the marching band at Penn State! I will be happy to relax after work, though, and not have to rush to practice. 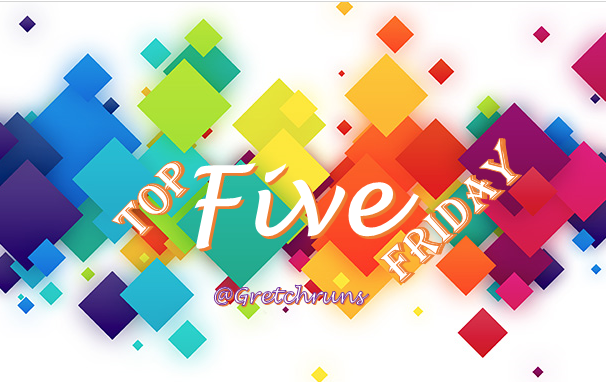 As usual, I'm linking up with Cynthia, Courtney and Mar on their Friday Five Linkup as well as Clare, Kate and Heather!! The topic for today was Spring, which was very vague. I decided to talk about my five favorite things about springtime! 1. Trail running. I mentioned this a bit in my Pittsburgh Running Routes post, but I absolutely love trail running. I grew up running at Riverview Park, and ran cross country in middle and high school, so I feel really comfortable on trails. I love how you never know what to expect, the hills are always rolling, and the scenery is beautiful (the above picture is from a trip to Colorado. Can't get scenery like that running on roads!). Spring is the perfect time to hit the trails! 2. Run Commuting. To go along with that, I love being able to run home from work. I live about five miles from my work, and can run along the Eliza Furnace trail. It's a great, flat, pedestrian/bike trail that takes you to the Southside or Schenley Park. I love it! To go along with that, I bought this bookbag last year and it's great for running (It was only $27 when I bought it, but now it's over $70! Similar here , here, and here for cheaper). It's comfortable, lightweight, and holds a surprising amount. 3. Spring Makeup. Once it warms up, my makeup routine becomes a lot simpler and brighter! I love to wear tinted moisturizers (a few of my favorites are Cargo and Smashbox) and colored liner (plums and navy blues are my favorite!). Bright nails are also a lot of fun and look nice and happy after months of wearing dark, moody colors. I'm currently in love with my Jamberry wraps, and I got a lot of fun designs for spring! 4. TOMS are my absolute favorite shoes. They're so comfortable and look really cute! I wore these on a long trip to Europe and walked miles a day and never had any problems. I still buy them every year or so, and love breaking them out in the spring and summer! They're so easy to slip on and run out, and come in a ton of styles and patterns. I like the more neutral ones (navy and black) but might try for a pattern some time, in fact I'm loving the one pictured above! 5. Seasonal food and drinks. As much as I love warm, hearty food of the winter, it starts to weigh me down and make me feel tired all the time. Spring reminds me of eating fresh fruit and vegetables, and nice light meals. I also love special spring beverages from bars and restaurants- from yummy sangria to spring seasonal drafts! I decided to switch it up this week and share my favorite spring-time songs! These make me think of warm weather, sitting outside and enjoying the sunshine, or cruising around with the windows down! This is such a catchy and easy-going song. Every time I listen to it with Dan, we always want to learn how to play it (he plays the trumpet). It's one of my favorite songs ever! Does anyone else think all of Maroon Five's songs kind of sound the same? I like their most recent song..it's nice and catchy and easy to listen to. I fell in love with the Who in marching band, because we played a lot of their songs. This is my favorite by them! Such a fun, fast-tempo song. I love everything on this album, but this might be my favorite! Whenever I hear this song, I think of Barney and Robin dancing at a wedding in How I Met Your Mother. This came out right after I was born, but I still love it today! Wednesday - 5x400 repeats. Total of 4.5 miles. Splits were 1:43, 1:41, 1:40, 1:38, 1:36. Felt great! I hope you all had a great week!! Tell me some highlights and some fun things you have planned for the weekend! That's great that you can run to work. I have never run trails, mostly because I am afraid I would twist an ankle. Oh wait, I have done that on streets! I am volunteering today and tomorrow at our local race expo (Quintiles Marathon) and running 10 miles on Sunday with my friend who is running her first marathon! If I take a break from trails and then try to run on them, my ankles kill me for a few days! It's definitely hard work. I think it helps toughen up my ankles and feet though..they're super strong! Have fun volunteering! I've never worked a race expo but I bet it's hard work and also a lot of fun :) Enjoy your weekend! Happy Spring! I've been wanting to try run commuting too. I live less than four miles from my office, so it's doable. I think I'm going to try it this spring! Oh, and I want to try trail running too! I totally agree with you about being over winter food, and ready for fresh veggies--and grilling weather! :) Also: bring on the salads! Happy Spring!! You got it! Thanks for the invite. I'm loving your blog!! I love toms too. Also, just read your trail post and i am so jealous! It looks beautiful! Thanks! I'm hoping to do a post dedicated to trail running since it's so near and dear to my heart. I'm glad you liked it! This summer I am hoping to figure out how to run commute to work. My husband and I moved this winter and now I live in an area where it should be possible. I also love jamberry. it stays on my toes longer than any pedicure! I need more trail running in my life! The picture looks amazing! I totally wish that I lived close enough to my job to run commute. Hopefully someday! Happy Spring! i work from home so can't run commute but i do regularly run to take care of my errands! That would be a very short run lol! That's great that you run to errands. If I work from home, sometimes I'll run during lunchtime to a business district that's about 2 miles away. The only bad thing is that its two miles downhill...which means I have to run uphill to get home! I wish I could run to work (I can walk), but I would get too sweaty. I really like Cargo as well. That is awesome that you can run home from work!